- This AR-15 Extended Bolt Release Lever allows right-handed shooters to release the bolt catch without moving the firing hand from the grip. In the case of High Power Rifle Competition, there is no more reaching over the top of the rifle and you don’t have to remove the rifle from your shoulder to reload. - Its a rugged but light-weight Delrin® lever that installs alongside and over the top of your bolt catch with a longer roll pin (included). The roll pin acts as a pivot axle. 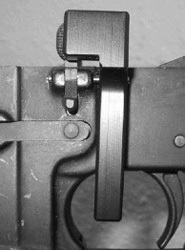 The lever only contacts the top of the bolt catch, floats on the new roll pin and extends down towards the front of the trigger guard. The lever requires a definite motion to release the bolt (for safety purposes) but can be released with just a press of your trigger finger. 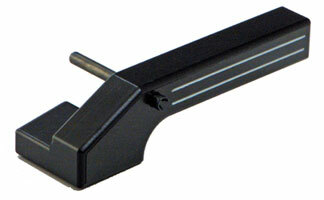 Extended bolt release levers are NOT allowed for Service Rifle Competitions, but great for Match rifles, bench rest, load testing, and varmint shooting.